PenDelfin leaflet with the PenDelfin rabbit Moppit on the front cover. The PenDelfin Moppit was designed by Jean Walmsley Heap and introduced into the PenDelfin family in c1996. 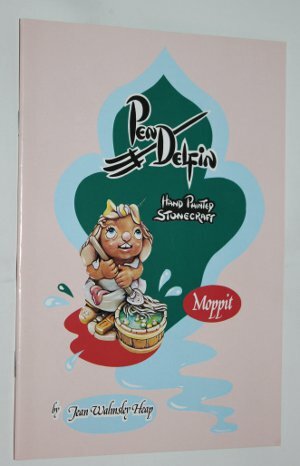 This PenDelfin brochure opens up like a book and contains 18 pages of PenDelfin rabbits and PenDelfin stands that were available to PenDelfin collectors when the brochure was issued. Inside this PenDelfin leaflet are many PenDelfin scenes including one page introducing The Dasher by Doreen Noel Roberts. Another features the PenDelfin Limited Edition Collector's Plates and the PenDelfn Village Tales books, The Family, Barney and Whopper along with the The PenDelfin Story recollected by Jean Walmsley Heap. Condition: Very good overall condition. A lovely brochure to add to your collection.